Rayan Poissonerie & Restaurant, or the "Muslim Red Lobster" as I like to call it, is a unique seafood restaurant in all respects. The way it works is that you walk right up to the seafood display and you can either purchase the seafood raw as you would at a grocery store, or you can ask for whatever you like cooked however you like, and they prepare it right away at the small kitchen just behind. 1. Select the seafood of your choice and the amount you would like. You could go by increments of 1/2 a pound, however fillets of fish are sold whole. 2. Specify how you'd like your catch of the day cooked. 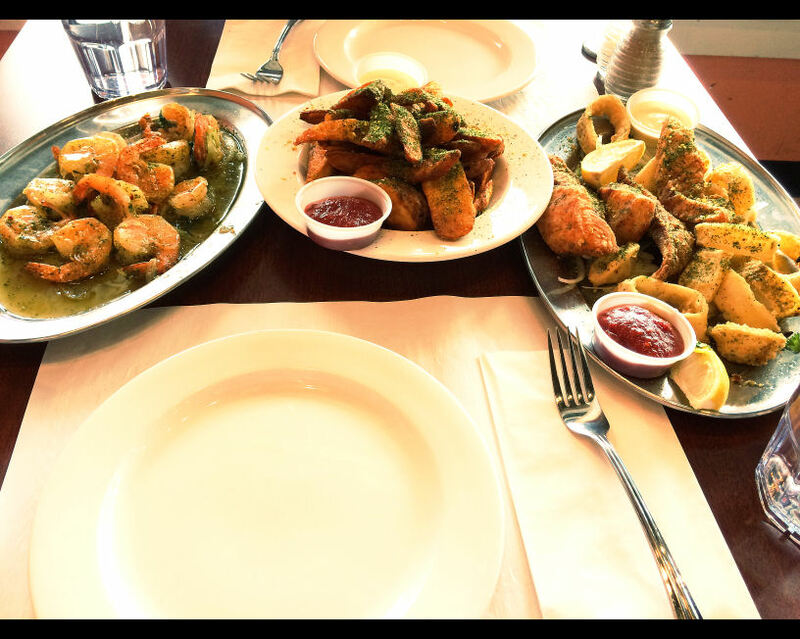 You can ask for your choices deep fried, pan fried, battered, sauteed in garlic and butter, and the possibilities are endless. 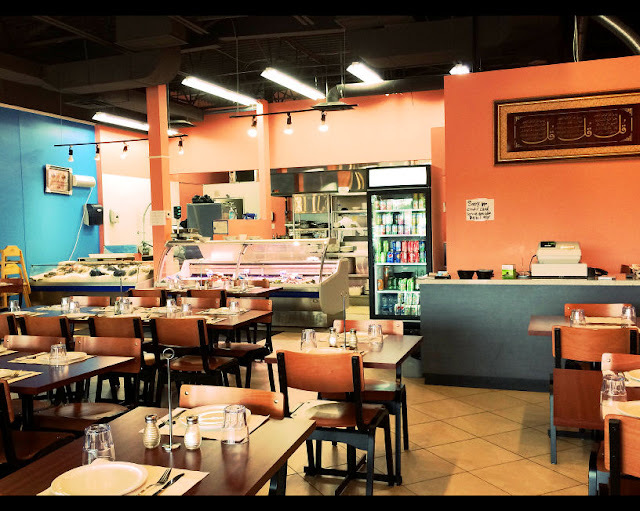 There's no menu, however you can also order some simple sides like salad, rice, or fries. 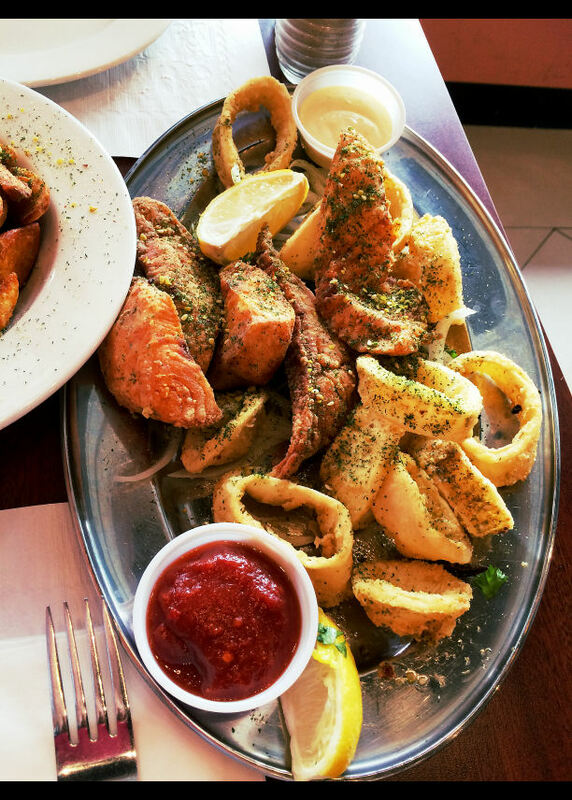 Our absolute favourite is Battered and Deep Fried Calamari, and we order it every single time. We also decided to go with a Fillet of Seasoned Tilapia (white fish) and asked for it to be battered and deep fried as well. The Calamari was cooked perfectly. Often times calamari is over done and turns out quite rubbery, but you could sink your teeth into these while still having a nice crispness from the fried batter. Paired with the house tartar sauce and drizzled with a squeeze of a lemon wedge, this is just the stuff of legend. Our first few times we went kind of wild and ordered A LOT of calamari, but now as seasoned calamari connoisseurs, we now ordered 1/2 pound, which was a perfect amount for two people. I was a little disappointed with the Tilapia however as I was expecting more of a "fish and chips" style batter with super moist white fish inside, however it was quite dry. Perhaps it was overcooked a little. I think next time we'll try the cod instead ('morue' in French). 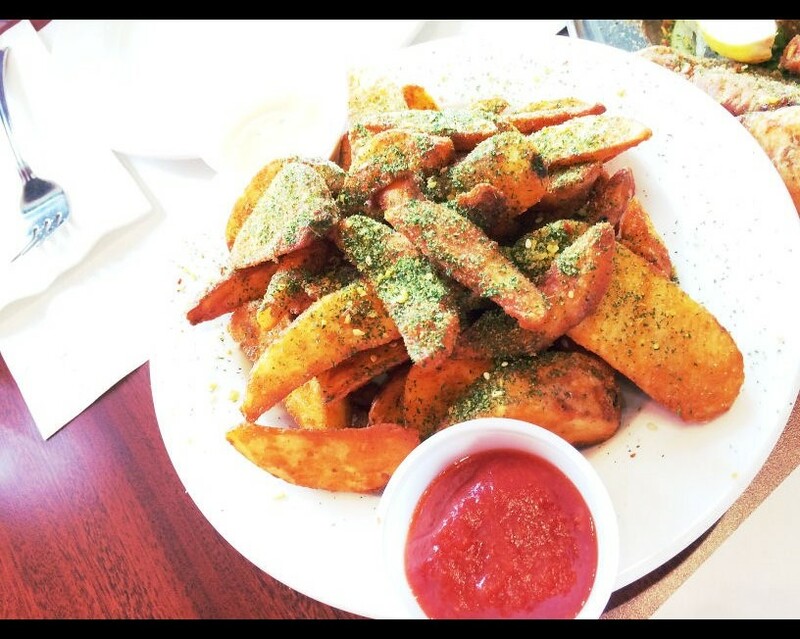 This is one small order of "fries" which turned out to be Deep Fried Potato Wedges, sprinkled with parsley and seasoning on top. They were steaming hot from the oil and pretty tasty, and the portion size was generous. I'd definitely order them again. As for favourite #2 - I present to you (small) Shrimp Sautéed in Garlic and Butter. I could probably eat these all day. They are de-veined but not peeled, so you have to peel off the shell and legs. You could also get this dish with large jumbo shrimp but of course at a much higher price. 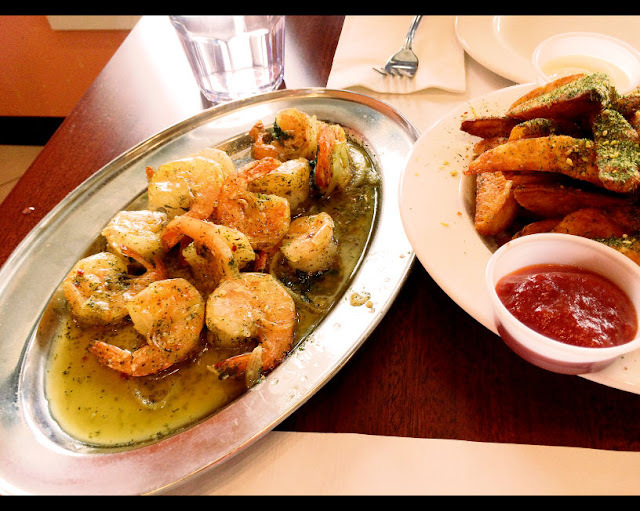 1/2 pound of small shrimp came out to be 12 shrimps, so it was good amount to share between two. Tip: Dipping the potato wedges in the garlic sauce from this dish is infinitely better than ketchup. When we were talking to some Ottawans about this place they said that this location wasn't as good as the original Montreal location, but I completely disagree. The customer service was excellent and we had a great experience here. We were greeted by the server twice and served kindly from the brother at the seafood display promptly. The manager (or owner?) guided us to our table and chatted with us asking if it was our first time there and was very friendly. As soon as we were seated the server brought us a jug of ice water and glasses, and the food took all of 10 minutes to arrive! This was in complete contrast to the Montreal location which is always very busy and somewhat chaotic, and whose customer service does need improvement. The only thing I'll give them is that they're always playing nasheeds, which is a nice touch. I'm giving Rayan all of the Wontons because this place keeps up its quality quite excellently and I'm always looking forward to visiting again. To my shock the bill was only a little over $30 with tax, for 1/2 pound of shrimp, 1/2 pound of calamari, a whole tilapia fillet, and a huge plate of potato wedges. We couldn't finish everything had had to take some home, and for $15 or so per person including tax, this meal is quite the steal! 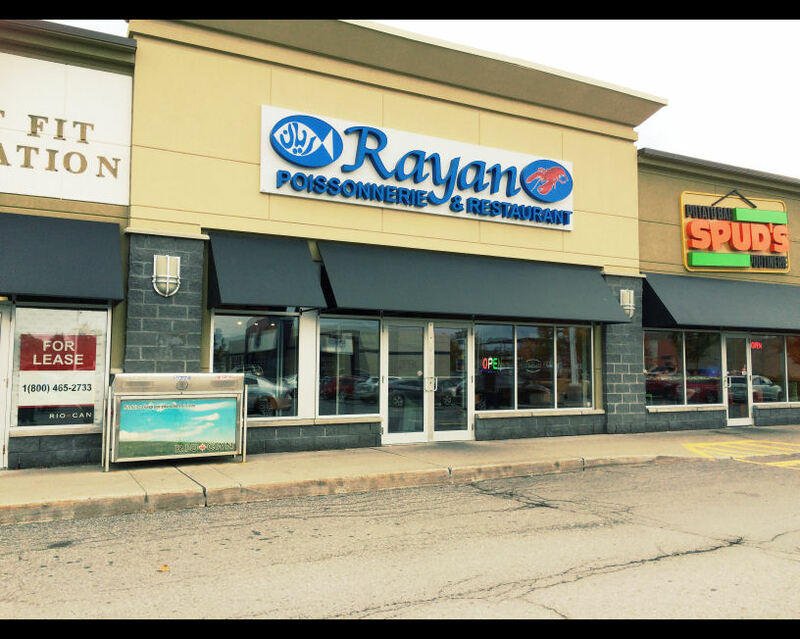 Thank you for the lovely experience, Rayan Poissonnerie! May Allah grant your business success, ameen.